“Front Yard/Backstreet,” is a new exhibit at the Palo Alto Art Center that attempts to re-contextualize the places where we work and live as networks of complex visuals. The exhibit explores the connection between people and their environment, while using the themes of maps and landscapes as the basis for the works on display. Here, maps are reframed as fine art, prompting viewers to reflect on the unique contours and colors that comprise them. Artists frequently portray cityscapes as complex geometries of lines and shapes. In “Walking, Week 51 in 16 Panels,” Laurie Frick utilized GPS technology to trace her steps through Brooklyn and mapped her route onto large expanses of laser-cut cotton paper. Craig Dorety and Jim Campbell’s “Inverted Pixel Array — Street Scene” decomposes a cityscape into simplified black shapes and multicolored glowing lights. It is particularly fascinating to consider how the glow of lights themselves overlap and create smaller patterns and hue variations. The work of Frick, Dorety and Campbell delve into the possible intersections between art and technology. The exhibit goes on to underscore the natural elements in our surroundings, juxtaposing geometric, man-made architecture with the rugged unpredictability of nature. Tanya Geis’s site-specific installation, “TBD,” is painted directly onto the wall of the gallery space using mud from the San Francisco Bay and watercolor paint; Geis’s choice of medium physically carries objects from the natural world into the gallery space. 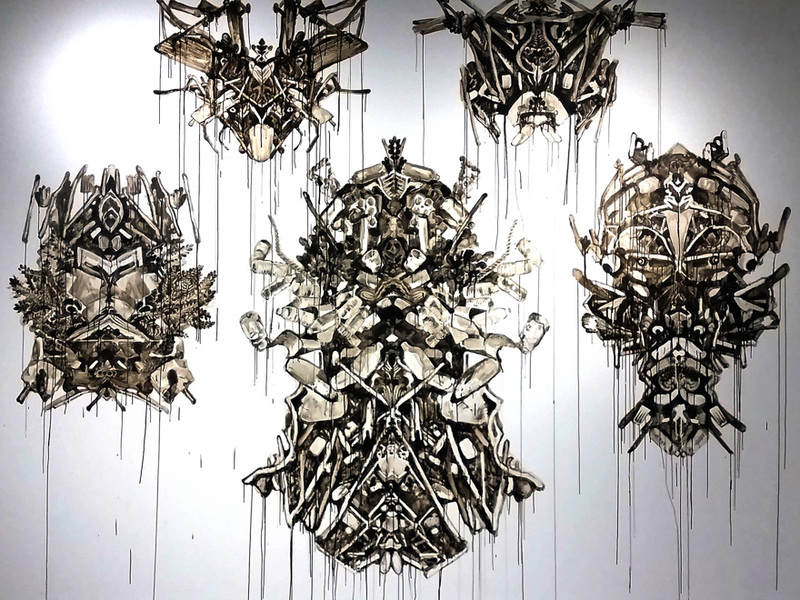 Painted entirely in a monochromatic brown, the piece portrays piles of junk whose shapes seem to suggest insects or other organic creatures. Geis makes a statement about environmental health and the adverse effects of human interaction with wetlands and oceans. The world comes to life when we actively engage with it; “Front Yard/Backstreet” depicts people as the convergence of the industrial and the natural. In a series of hyperrealistic graphite and charcoal illustrations, Joel Daniel Phillips, artist-in-residence at the Palo Alto Art Center, journalizes his interactions with the Buena Vista Mobile Home community in Palo Alto. Phillips portrays his subjects alongside their mobile homes, accompanied by a selection of shrubbery and potted plants to indicate a sort of harmony between the elements of his drawings. As part of a community effort to grow the local arts scene, “Front Yard/Backstreet” is accessible to art world newbies; however, the exhibit’s accessibility does not detract from its conceptual and emotional depth. The works on display toy with the idea of balancing opposites and make us consider the strange visual relationships hidden in the world around us. Contact Eric Huang at eyhuang ‘at’ stanford.edu. “Front Yard/Backstreet” is on view at the Palo Alto Art Center until Dec. 13, 2015. Eric Huang is a junior at Stanford University hailing from Irvine, California. An aspiring computer science major and art practice minor, Eric's passion for visual arts manifests itself not only in his practice, but also in his writing. To contact Eric, shoot him an email: eyhuang@stanford.edu.